Howaya, c’mon in, pull up a chair and I’ll stick the kettle on. It’s time for me to share the secret of my perfect Irish brewed tea with you. If you know me at all you’ll know that the gears of the household are greased by copious amounts of strong Irish tea. None of your wishy washy stuff for me thank you very much. If it’s not golden then it’s not tea. You like it weak with a good dose of milk? Well just leave the teabag in when you’re making mine thank you very much. First things first, get your equipment together to make this strong brew. You’ll need a clean, empty kettle. Make sure there isn’t a bit of water in it. If you have a kettle that is jampacked with limescale then 1/4 fill with table vinegar, top up to half with water, then boil the kettle before pouring the contents away. Then fill and boil the kettle once and discard all the hot water before using boiling water from the kettle. There’s a frugal descaling tip for you for free. Now back to the perfect cup of tea. Fill your kettle with fresh, cold water from the tap. Then put on the boil. In the meantime, get your mugs together with your teabags. I use a mug because I want my tea to stay warm for longer than a hedgehog’s sneeze. If you don’t tend to have children, husbands or various others pulling out of you in all directions then you may be able to enjoy a hot cup of tea from a china cup. If so, I envy you, a lot. Put 1 teabag in each mug. As soon as the kettle has boiled then pour the hot water over the teabags. If you have to reboil the kettle and want the perfect cuppa then you’ll need to empty the kettle and start again. If you’re lazy and parching for a mug of the amber nectar then sure boil the kettle again but be warned it won’t be as good. 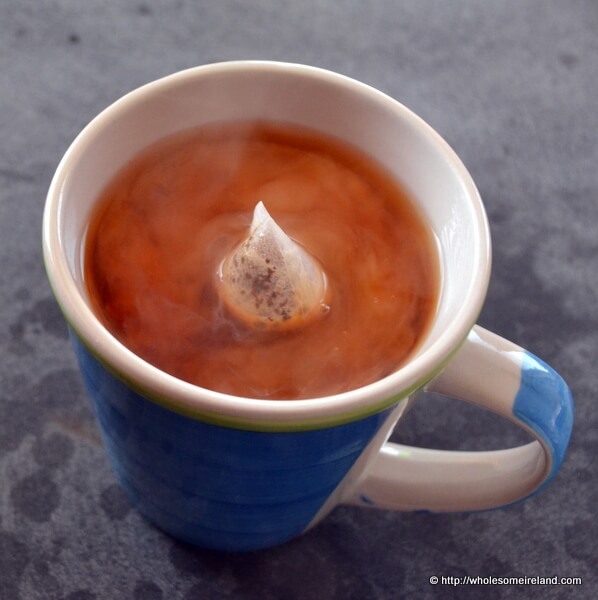 Leave the teabags to steep for at least 1 minute before stirring and removing. If you can see the bottom of the mug through the tea then it’s not real Irish tea. A dribble of milk and then you’re done. No sugar for me thanks, I’m sweet enough. If you’d like to see what kind of treats I enjoy with a good cuppa’ then you can pop over to my friend Emily at From China Village who is celebrating all stuff tea this week. She kindly asked me to suggest some yummy bits and pieces to add to the blog and I’ve happily obliged. It’s a great example of how small a place Ireland is because we “met” through Twitter but our husbands know one another! If you want to hear the process from start to finish along with me yakking a bit more about tea and how it should be made then click here. Don’t take this post too seriously. 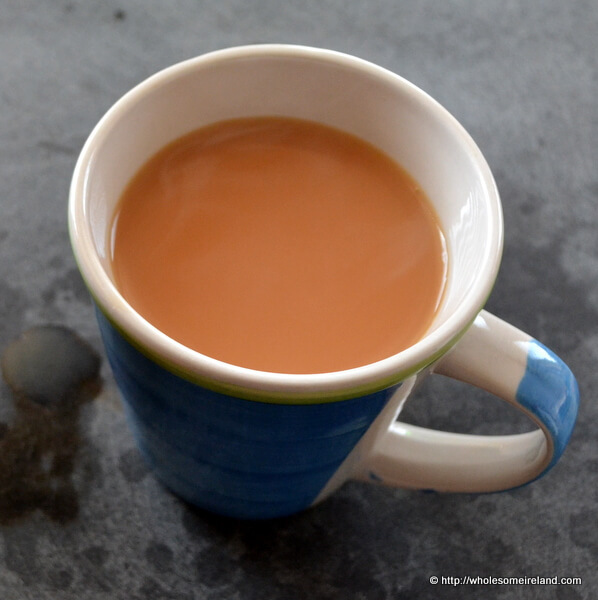 Everybody has their own way of making a good cuppa so shout out below or over on Audioboo and let me know how you like it. The kettle’s on, just make sure it’s Proper Irish Tea. Hahaha Kathryn! I actually do drink tea from leaves, just a teabag is way simpler. I’m a big fan of Campbells or Barry’s loose leaf. It’s got to be in a teapot for proper tea! Well yes but when I’m juggling the kids I’m all for a swift brew in a mug. Also a pot of hot tea & a mug of hot tea can be dangerous with little people around. Easier to keep it to just the one hot item! Mind you at the weekends etc I’d drink it by the pot. It’s not tea unless it’s brewed for four minutes. Brown water otherwise. Bill, my absolute minimum is five minutes. I even set a timer! I use a timer, too! I’ve only just spotted this comment Bill. No idea how it ended up in Spam folder, I think it’s something to do with the link. I do however love the quote. Very apt! Not tea if you can see the bottom of the mug once brewed. It needs a good stew! 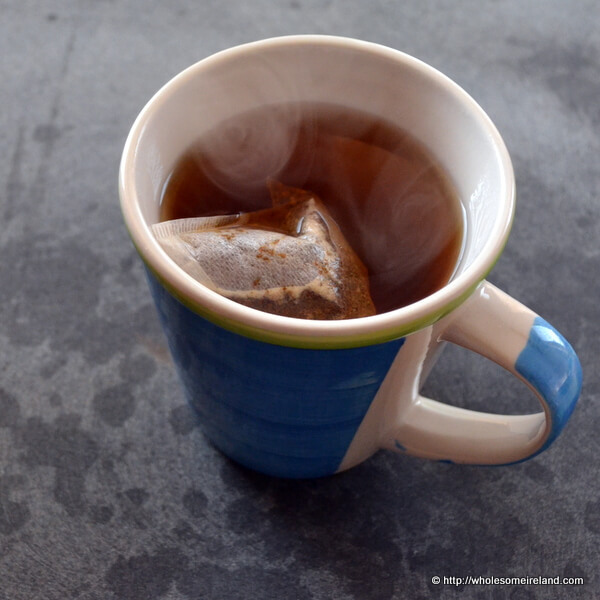 I have a friend (American, of course) who thinks she’s making me tea when she heats up a mug of water in the microwave and then puts a teabag in it. I don’t have the heart to tell her how wrong it is. Sigh. Way, way, way wrong. Beyond wrong. Yeuch! Teehee, loved this C! We visited a tea plantation yesterday and a tea factory in Sri Lanka. It’s mad seeing how the tea we enjoy is made 🙂 Can’t beat a decent cup of tae. Brilliant. I’m sure the trip has been fantastic. It’ll be a big bump to come back to the Isles! I never have the time to drink a pot of tea to be honest. When the kids are older I’ll dust off my stash of 12 and use a pot a day!